A memorandum of understanding (MOU) was signed between APAARI and National Chung Hsing University (NCHU) on December 17, 2018. 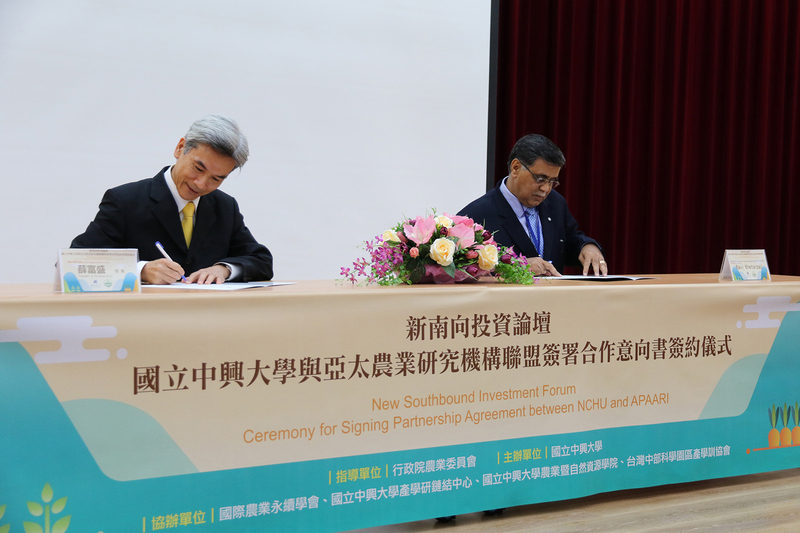 The MOU was signed by Fuh-Sheng Shieu, President of NCHU, and Ravi Khetarpal, Executive Secretary of APAARI. NCHU is the first research institution that APAARI has established formal partnership in the aim to jointly advance agriculture development and innovation in Asia-Pacific. APAARI is one of the important agriculture organizations in the Asia-Pacific region and continue to address significant international agriculture issues by holding seminars, training courses and publications. APAARI’s contribution in promoting knowledge and experience sharing has prompted it to gain increasing importance and influence throughout the world. In order to promote sustainable agricultural management in the Asia-Pacific countries, APAARI has drafted visionary goals for 2030. One of them is for its members to establish Center of Excellence (COE) in the Asia-Pacific region, such as Malaysia, India and Taiwan. The target is five COE in total. In fact, Taiwan is currently planning to establish the APAARI Center of Excellence on Value Chain (APAARI COE) at the National Chung Hsing University. The key work of the APAARI COE include：(1) promoting “sharing resources” among Asian agricultural institutions; (2) strengthening research and innovation in Asia Pacific for sustainable agriculture development, (3) assisting the application of an Asian agriculture productivity and marketing value chain in the Asia Pacific region. 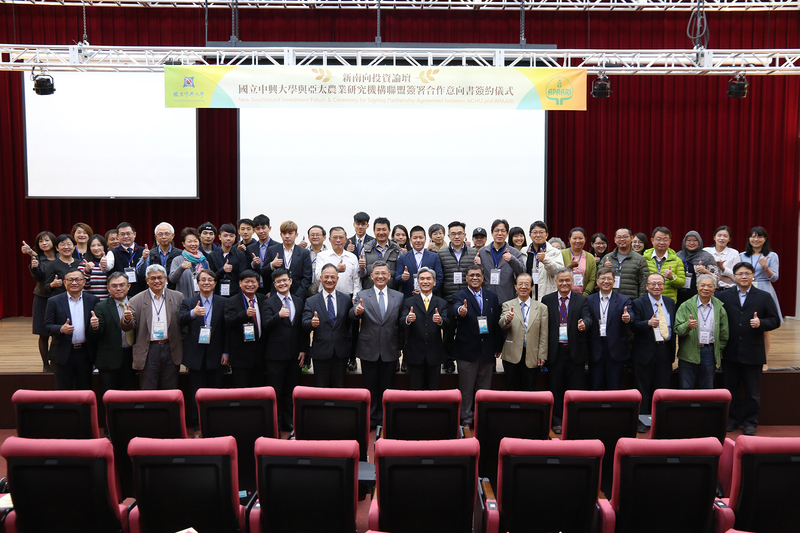 In recent years, Taiwan actively promotes “New Southbound Policy.” The Executive Secretary of APAARI, Ravi visited NCHU and was personally impressed by its international agricultural research achievements. It was this reason that prompted the idea of cooperation and eventually an MOU. In 2019, APAARI COE on Value Chain would be further established in NCHU. 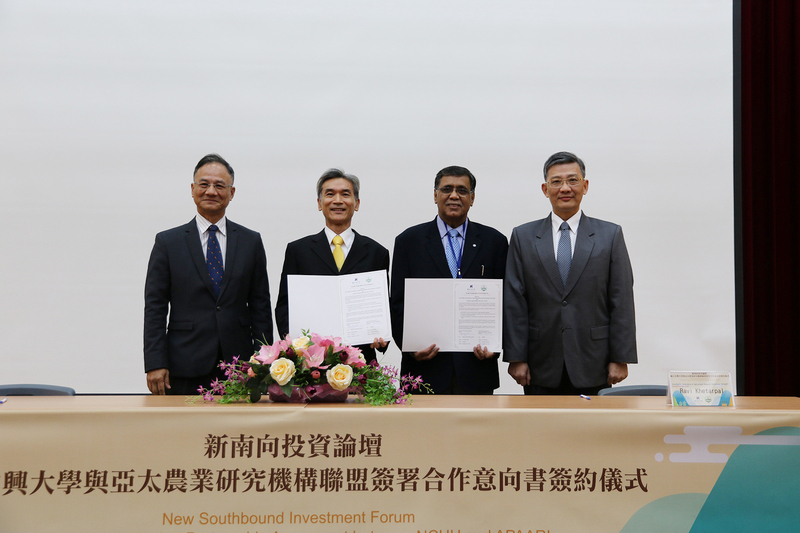 The MOU was signed by Fuh-Sheng Shieu(left 2), President of NCHU, and Ravi Khetarpal(right 2), Executive Secretary of APAARI. The MOU was signed by Fuh-Sheng Shieu(left), President of NCHU, and Ravi Khetarpal(right), Executive Secretary of APAARI.